MILLINGTON, Tenn. -- The International Hot Rod Association announced its 2013 special award winners and unveiled its two Summit SuperSeries prize dragsters all at the 2013 IHRA Awards Celebration Friday morning at the IHRA Summit World Finals at Memphis International Raceway. 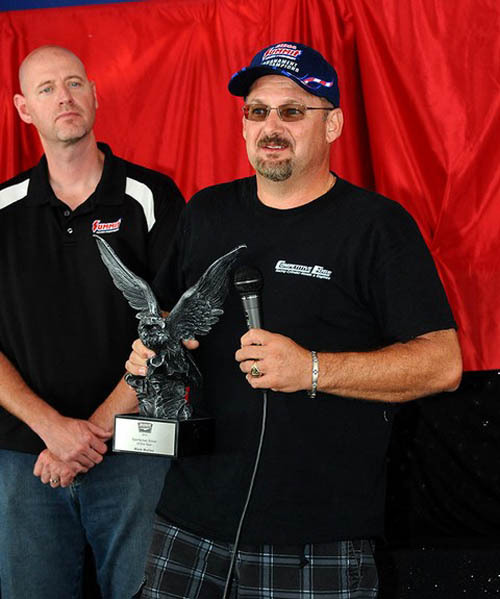 Longtime Hot Rod racer Greg Fowler was named the 2013 recipient of the IHRA's most prestigious award, Sportsman of the Year, given for excellence on and off the dragstrip. 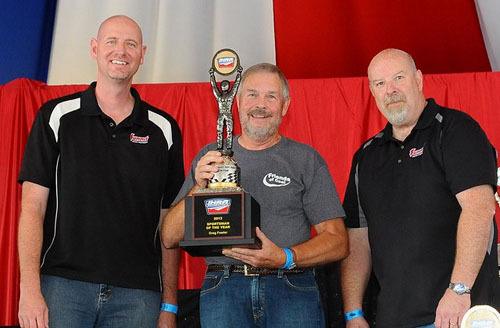 Fellow Hot Rod racer Mark Mullen was named the 2013 IHRA Sportsman Driver of the Year at the celebration for his dominating run in Division 2. The International Hot Rod Association's Top Performers per division were Mark Payne (D1), Mark Mullen (D2), Jacob Elrod (D3), Kamron Wright (D4), Mark Faul (D6) and Marvin Dunahoo (D9). IHRA's Top Pro-Am tracks by division were Richmond Dragway (D1), Carolina Dragway (D2), Grand Bend Motorplex (D3), State Capitol Raceway (D4), Eagle Motorplex (D6) and Farmington Dragway (D9). Fowler was named the 2013 Sportsman of the Year for his good works in a number of different arenas. In addition to promoting several causes near to his heart, the West Virginia native also uses his 1980 Camaro as a tool to teach kids about the dangers of tobacco as he displays his blue and gold machine at schools throughout the state. Fowler has also donated his time and race trailer to deliver Christmas gifts to children in the Mountain State. For his work, Fowler has even been recognized by the governor of West Virginia. On the track Fowler has had a successful career with a number of national event wins, a Summit Pro-Am Tour championship and spots in the Summit Tournament of Champions and Summit All-Star race. Fellow Hot Rod racer Mark Mullen was named the 2013 Sportsman Driver of the Year for his achievements on the track. Mullen stormed onto the scene in 2013, reaching the finals in his first four races and going on to win three of them. Thanks to that incredible run, plus a consistent finish to the year, Mullen was able to run away with the Hot Rod championships in Division 2, racking up the most points of any driver on the Summit Pro-Am Tour this season with 504 points. Finally, the IHRA closed the celebration by unveiling the 2013 IHRA Summit SuperSeries prize dragsters given to the winners of the Top ET and Junior Dragster classes during the Summit World Finals. The two dragsters, featuring a beautiful orange and blue design painted by Jerron Settles of Imagine That Customs and built by outstanding builders Maddox Race Cars and Vic Puglia Race Cars, brought the crowd to their feet. Vic Puglia, Jerron Settles, Dale Maddox and Kip Maddox. Settles, Puglia and Dale and Kip Maddox were on hand to unveil the two dragsters, in addition to Jim Greenleaf and Don Lower from Summit Racing Equipment and Mike Downs from Trick Flow. 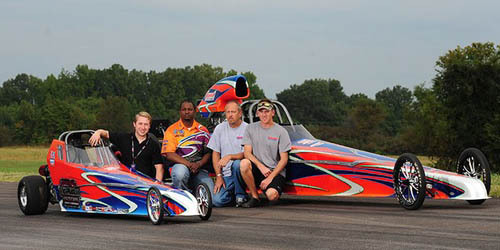 The 2013 IHRA racing season will conclude this weekend at the 2013 IHRA Summit Racing Equipment World Finals at Memphis International Raceway.